Note: power lines are NOT shown on the map. Don't be confused!! The terrain at Quarry Lake is very varied. It has gentle to moderate slopes, fast open forest to slower marshy lands, and areas of high detail and some less detail areas. Part of the navigational challenge will be to constantly adjust your technique to suit the terrain. Forest is a mix of pine, spruce and poplar. On average the runnability and visibilty are good. Patches of deadfall and spruce saplings can be avoided with minor course deviations. There are quite a lot of trails in the area. There are a few boulders up to about 2 metres in size. There are many remnants of earlier mining operations. For simplicity, no rootstocks are marked on the map. Parking/Info Desk to Arena: 1.5km (approx), gentle walk on smooth trail. Arena to Start: approx 100m. Be sure to budget enough time for walking from the parking to the arena & on to the start. You can leave extra clothing at the arena. There is a remote arena today with limited facilities. From the Nordic Centre there is a relatively easy 1,500m walk along gently sloping terrain to the arena. The walk includes crossing a road - please be safe and cross at the intersection nearest to the arena. We encourage you to carry all your gear to the arena and enjoying the atmosphere of the forest location. Things to bring include: drinks, food & snacks, change of clothing, shade (tent or tarp for example), bug spray (just in case). Water: very limited water available for finishers only. Please bring your own drinks. Vendors: there will be no vendors at this event. If you need orienteering gear please visit the O-Store online store well in advance. 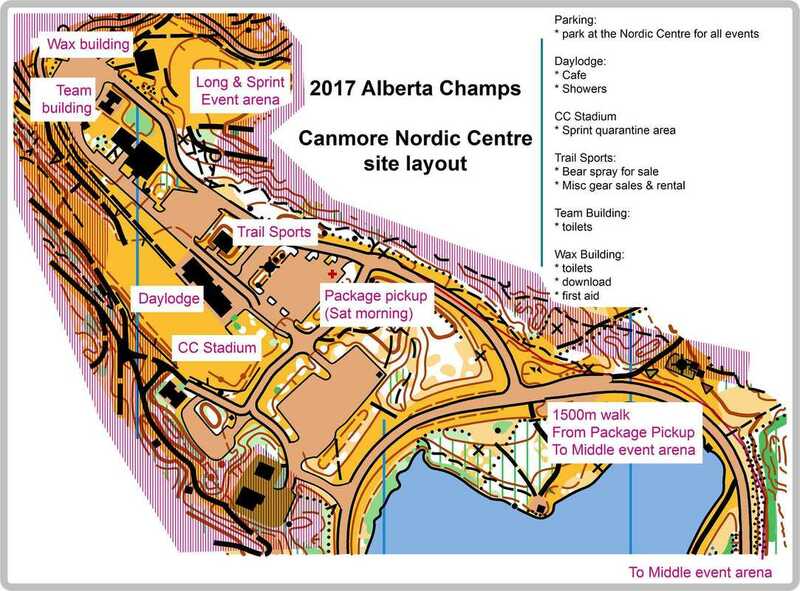 You must go to the parking at Canmore Nordic Centre before coming to the race. There you will sign a waiver, pickup your race bib, and get a copy of the warm-up map. There is a small part of the map on the north side of the road that you may use as a warm up area. You must wear your bib for all races. You pick up your bib at the Info desk in the Canmore Nordic Centre parking lot prior to this race. We are sharing the park with many other park users, including bikers, hikers, dog walkers, weddings, and more. In order to protect our access to this area, please respect all other park users and yield the tracks and avoid startling other users. Carrying bear spray is mandatory in this event. Please see the Bear Spray page for more information.